Home > Blog > Tell Me The Truth: Do Truth Serums Work? Tell Me The Truth: Do Truth Serums Work? The trope of a magical truth serum permeates popular culture, and it often has a tinge of the magical. tvtropes runs through a veritable wealth of examples, from TV, comic books, movies, music, and mythology. Remember Wonder Woman's magic lasso, not a serum, to be sure, but remarkable effective nonetheless, which made others tell her just what she desired to know? The Harry Potter books introduce a (magical, of course) truth serum called Veritaserum. Following the use of it is rather complex for those not familiar with the series, but the beloved headmaster Albus Dumbeldore uses it on one Barty Crouch, a death eater (i.e. not a good guy), who'd been impersonating someone else's identity--and under its influence Barty confesses. Things turn out less well in Return of the Planet Apes, when Dr. Zira, a biologist who studied humans in the future when apes rule, is given a dose of Sodium Pentothal (tone of today's equivalents of a truth serum)--and what she reveals is disastrous. 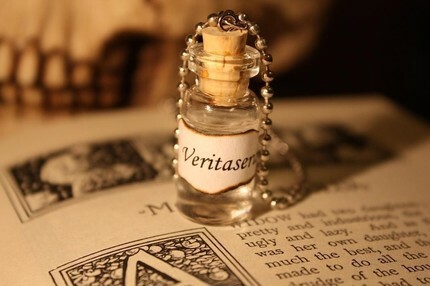 Humans have always sought a magical potion that would make others tell crucial truths, and the need for it has seemed more urgent as crimes become more devastating and destructive. In Roman times the potion was as simple as fermented grapes, and the belief was that in vino veritas, that after drinking wine people would spill the truth. The definition of truth serum today is not wine but is rather a drug that induces a state where a person can't help but to answer questions truthfully. And, conveniently, there's not just a name brand but also and a generic of today's version of the most well-known truth serum. Although many believe a drug called scopolamine has truth-spilling qualities, the best-known truth serum today is a barbiturate manufactured by Abbott Laboratories and called Sodium Pentothal, generically known as sodium thiopental. A yellow crystal, it can be dissolved in water or alcohol, and then requires an injection. Although famous for its supposed truth-revealing coercive potential, it is lesser known--but more wisely used--as the first of three drugs administered during lethal injections in the U.S. Both alcohol and the barbiturates work by binding with the gamma-amniobutyric acid, or GABA, receptors in the brain and spinal cord, preventing the GABA from being absorbed by the nervous system, particularly the brain. According to ScienceDaily, a 2011 article in Biological Psychiatry found that men with lower levels of GABA in their brains displayed more aggressive behavior and were significantly more impulsive than those with higher levels. The irony of the truth serum, considered by many countries as a form of torture when used to extract confessions, is that its origins are so innocent. i09 writes of one Dr. Robert House, in the first quarter of the 20th century, who first thought of it as a means of exonerating innocent prisoners. Dr. House noticed that when he administered scopolamine, a strong depressant, to women during childbirth, it seemed to act like, well, a truth serum. It induced confusion and disorientation, plus amnesia for events experienced while under its influence. Yet, the CIA points out in its piece on "'Truth' Drugs, the sleepy women answered questions correctly and often were quite frank in information they volunteered. The pregnant women spoke unthinkingly, holding back nothing, and seemingly forgetting that they were in the process of giving birth. Dr. House thought of those stuck in jail, who repeatedly maintained their innocence. If a drug could make women forget they were in the rather indelicate process of childbirth, he figured, it could also make criminals forget they were in jail, and make them answer honestly, without calculation, about where they had been and what they had done on the night of a given crime. He was quite excited, and interviewed two prisoners 'known' to be guilty in a Dallas jail under the influence of scopolamine. Under the drug both men denied their crimes and were found not guilty at trial. In the 1922 issue of the Texas State Journal of Medicine House wrote that a patient under the influence of scopolamine "cannot create a lie ... and there is no power to think or reason." Thus the public was formally introduced to the idea of an official truth drug. The CIA asserts that the term 'truth serum' was first introduced in the Los Angeles Record in 1922, in discussing House's experiment. Due to some truly nasty side effects, scopolamine soon found itself disqualified as a truth drug. Hallucinations, sleepiness, headache, rapid heartbeat, blurred vision, dry mouth--all these made the drug undesirable. But soon others saw uses in truth serums that were helpful, as well, and they turned to barbiturates. According to News Medical, barbiturates are central nervous system depressants, and, as such, produce a whole host of effects. They can cause a person to feel mildly sedated--or knock him out completely. They are also used as anti-anxiety medications and hypnotics. By 1935 the head of the Michigan Crime Detection Laboratory at East Lansing was busy using barbiturates on more difficult suspects. He was to be the known first of many. The original Sodium Pentothalvwas invented in 1936, in Chicago, originally as an injectable pain killer and anesthetic. Abbott researchers Ernest H. Volwiler’s and Donalee L. Tabern's invention was so crucial in the field of anesthesiology that it earned the two places in the national Inventors Hall of Fame in Akron, Ohio. The drug is still commonly used for putting patients under before they're given another longer-acting anesthetic to keep them asleep for the rest of an operation. But doctors soon found that although Sodium Pentothal could relax a patient, and a big dose could knock the patient out, it actually didn't do much as a pain killer. So pain doctors turned their backs on it--but psychiatrists saw a new use. During the World Wars psychiatrists saw soldiers with such bad shell shock that they could hardly speak--or couldn't speak at all. Sodium Pentothal worked well in lowering the soldiers' anxiety and inhibitions and allowing them to speak--and thus recover. The English still use it today for treatment of phobias. The truth serum repertoire expanded during World War II when the Office of Strategic Services, a U.S. government intelligence agency, was issued orders to find a truth drug. After testing several drugs, they chose marijuana as the best available truth serum, and named it TD, or Truth Drug. That very hilarity became a problem, as it distracted the subject from the task at hand, and the loquacity sent them off on tangents irrelevant to the line of questioning. At the same time scientists were become more convinced that barbiturates could open up people to revealing the truth. One D.P. Morris, in 1941, wrote an article, "Intravenous barbiturates: an aid in the diagnosis and treatment of conversion hysteria and malingering," in which he revealed that intravenous sodium amytal (amobarbital sodium), another barbiturate like Sodium Pentothal, was quite helpful in discerning which soldiers were shirking duty and which were truly ill. The soldiers, as they came under the influence of the amytal, revealed the causes of their malingering. The police weren't far behind in wanting a drug that seemed to have such potential in opening up a subject's mind--and mouth. But sadly for police dealing with criminal operatives, or the CIA dealing with terrorist masterminds, all truth serums are far from reliable. One of the few actual scientific studies run on a truth serum, in this case sodium amytal, indicated that subjects are quite capable of lying while under the influence of a barbiturate. The CIA quotes a study down at Yale where 9 subjects voluntarily revealed shameful episodes from their past, and then invented fake cover stories, all for the purpose of the experiment. When the subjects were closely questioned about these cover stories, the results indicated that individuals without sociopathic or neurotic tendencies could stick to their made up story and not reveal their secrets. The scientists found that 'neurotic' subjects, in contrast, confessed more easily--but often confessed to offenses they hadn't even committed. Interrogators have found these results themselves, where they often get more than they bargained for from a subject under the influence from a barbiturate--but less than the truth. While Sodium Pentothal and sodium amytal will lower a subject's inhibitions so he becomes vastly more verbose, they won't, in point of fact, make him reveal the actual truth. Slate writes that "[s]o-called truth serums lower your inhibitions, and as a result you may become chattier but not necessarily more truthful. Losing your inhibitions isn't the same as losing your self-control. Subjects who have been administered a "truth serum" can lie, they can fantasize, and they can be manipulated into telling falsehoods by an interviewer's suggestions and cues." It seems that in the barrage of verbiage that comes out of the mouth of one injected with a truth serum might be an important truth--but might also be a whole lot of garbage, and it would be impossible to know the difference between the two. Experts believethat up to half of what a person says under the influence of these drugs is either a complete fiction or a distorted truth. Steven J. Kingsbury, associate professor of clinical psychiatry and behavioral sciences at USC's Keck School of Medicine says, "It's just like hypnosis. There is a lot of research that shows that while you can get more memories while a person is hypnotized, you get a greater percentage of both true and false memories." In fact, the Sydney Morning Herald baldly tells us, ". . . no chemical has yet been found that is guaranteed to work." Also, inconveniently for those running the War on Terror, it's illegal to use these drugs in this country and has been for decades. Use of the truth serum to extract a confession was declared unconstitutional in the U.S. by the Supreme Court in 1963. The court wrote in its decision, "Numerous decisions of this Court have established the standards governing the admissibility of confessions into evidence. If an individual's ‘will was overborne’ or if his confession was not ‘the product of a rational intellect and a free will, his confession is inadmissible because coerced. These standards are applicable whether a confession is the product of physical intimidation or psychological pressure and, of course, are equally applicable to a drug-induced statement. It is difficult to imagine a situation in which a confession would be less the product of a free intellect, less voluntary, than when brought [372 U.S. 293, 308] about by a drug having the effect of a ‘truth serum.’"
That seemed to satisfy people--until the War Against Terror. In 2002, former CIA and FBI director William Webster said that the U.S. should consider administering "truth drugs" to al-Qaeda and Taliban captives at Guantanamo Bay, Cuba, to find out information about terrorist operations. Webster said drugs like Sodium Penthothal were not torture, and certainly might help the U.S. be more effective in its fight against al-Qaeda. The powers that be were apparently non-responsive. And then, just this past year, recently declassified documents indicate that there was forcible administration of scopolamine to the detainees in Guantanamo Bay. The U.S. government has yet to respond to these allegations. While it's true that Guantanamo Bay is outside U.S. borders, the human rights group Amnesty International asserts that using these drugs in interrogations is outlawed under international standards. But they can't make every country follow those standards. In 2007 in a famous case, police in India drugged two suspected serial child killers. As expected and desired, the two came out with all the details of their supposed crimes. In fact, using Sodium Pentothal has become increasingly common in India since 2000. Of course there's no way to know if the supposed killers' confessions were accurate--but the police had their criminals, and were able to close the case. While some countries may still furtively be using them, the defects of ‘truth serums’ are too great for the information to be consistently reliable. In fact, interrogators would be better off--and would save a bundle--with good, old-fashioned wine. Or, of course, Wonder Woman's lasso.